RISC OS is so intuitive to use its User Guide is how big? 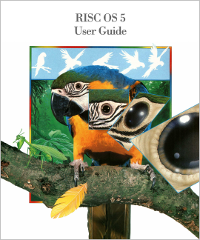 A new version of the User Guide has been published by RISC OS Open Ltd – the first printed edition since Acorn’s last one in 1996, and one that is bang up to date with the latest stable release of RISC OS, version 5.24 released in April. The new tome is a mighty one, with a total of sixty two chapters and eight appendices, all of which span a total of 616 pages, and it features over nine hundred images to illustrate the text and make it easier to digest. There are also character map tables covering each of the built-in alphabets, and numerous corrections have been made to original material that otherwise remains relevant, and revisions and updates where necessary, including to drawings and screenshots. Those sixty two chapters include or are based on many that were in the original User Guide, and some have been incorporated from the Welcome Guide, to provide a good introduction for new users on how to use RISC OS. There are also extra chapters covering the extra bundled applications and up to date features of RISC OS 5, and two detailed tutorials to provide a good grounding in Draw and Paint. The effort to produce the new User Guide has very much been a community one, benefiting from contributions, reviewing, and proof-reading from members of the RISC OS community – and regular donors to the RISC OS General bounty have also helped, because some of the funds raised from that have gone towards the software used to edit the book, ISBN numbers, and so on. As such, if you were a regular donor to that bounty as at April 2018, you are being rewarded with the option to have the postage and packaging costs waived if you buy the new User Guide, no matter where in the world you live – simply select the relevant option from the drop-down menu when ordering. The normal price for the book is £20.00, but being a bit on the heavy side, the normal P&P rates mean that for UK customers it costs £24.50, for those in mainland Europe it costs £31.50, and for customers anywhere else in the world it costs £37.50 – so depending on where you live, that could amount to quite a saving!